As I seem to be knitting lots of big projects at the moment, I felt the need to whip up a quick fix project. You crafters know what I'm talking about. The sort of project that only takes a couple of evenings to complete. It gives you that rush of accomplishment that only a finished project can bring. I miss that rush when I'm working on big projects. I'm not by any means just a "Product" knitter, I enjoy the process greatly, but sometimes I really need to feel that sense of achievement that only a Finished Object can bring. In this vein, I dug out a skein of left over Noro Silk Garden, and cast on the Calorimetry from Knitty.com. 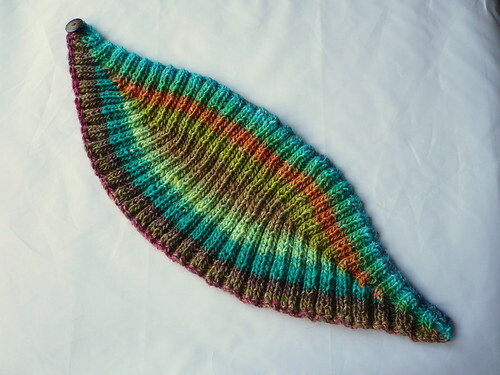 This free pattern uses less than a 50g skein of aran or worsted weight yarn and knits up incredibly fast. 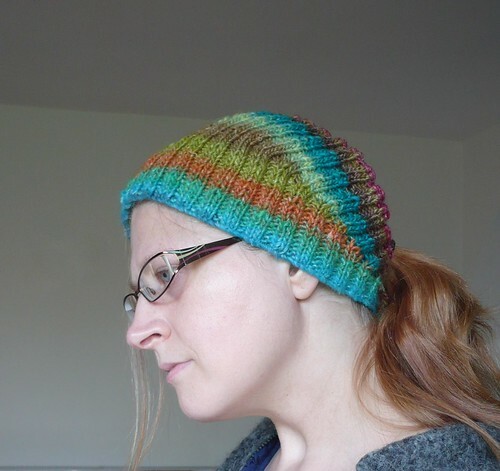 It is basically a knitted headband that fastens at the back of the head with a button. It covers the ears and keeps the head snug, without forcing you to wear your hair down. Isn't it a brilliant idea? This time of year when it is cooler but not cold, I like to have my ears covered, but a hat makes my head too warm. 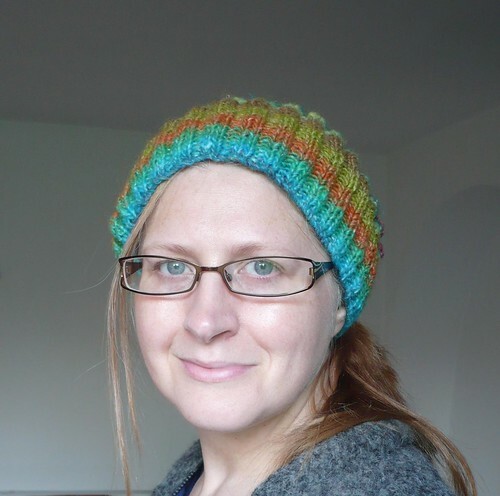 This is an elegant solution, and means I don't have to change my hairstyle if I want to leave the house with warm ears! This is the shape of the headband. 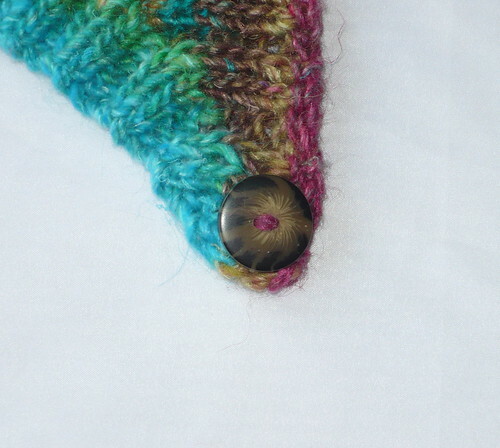 It is made by creating short rows to make the ends thinner than the centre. This means there is no bulk at the back of the head, which would happen with a straight band. The holes made by creating the short rows are used as button holes. For this project I used a rescued a button from a much loved and battered acrylic cardigan from my teens, that was beyond wearing anymore. I think it works perfectly with this yarn. As this is a finished object and it is a fibre based one too, I will be linking up to my usual parties. Have a click and see what everyone else is finishing off today!